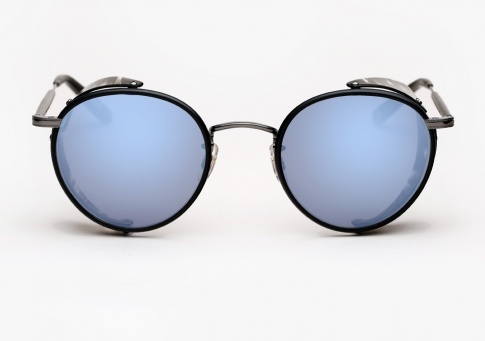 Garrett Leight Wilson Sun Shield - Black Stripe w/ Chrome Mirror Need Help? The Wilson Sun Shield is a contemporary take on a old-school classic design. An intricate frame perfectly executed, it features authentic acetate Windsor rims, detailed metal filigree, mixed antiqued metal, and thin acetate side-shields. It is offered here in black with "Black Stripe" side shields, paired with "Chrome" Mirrored lenses. Stainless steel with Windsor rims, acetate side shields and temples.